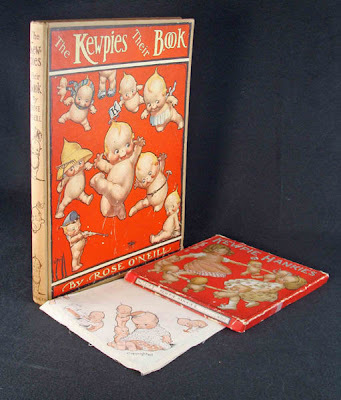 First edition of the first Kewpie book. A simply miraculous copy of The Kewpies, Their Book (1913), the volume by Rose O'Neill (1874-1944) that introduced the precious characters to a wider world beyond that of the ladies magazine audience that initially embraced them, has come to market. In outstanding condition in the publisher's scarce original box, the book is enhanced by the presence of a set of three Kewpies handkerchiefs, rare in and of themselves and exceeding scarce in as-new condition, as here. 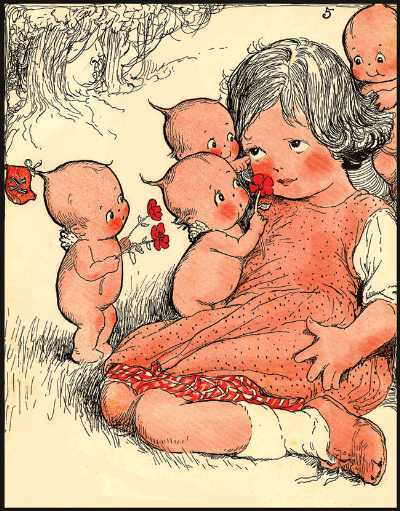 Rose O'Neill was one of the first, if not the first, American authors to exploit her creation to establish a strong, evergreen brand through licensing the Kewpie name and image to manufacturers. A merchandising phenomenon was born. Postcards, the stitched handkerchiefs seen here, cast-iron dime banks, jewelry, talcum powder dispensers, lamp bases - you name it - were among the many Kewpie-branded products that were available to fans young and old. 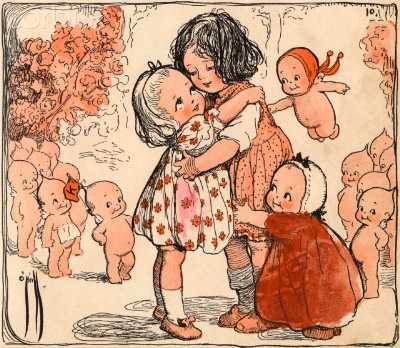 By the 1920s the artist had licensed Kewpie dolls to be manufactured in Germany. The Kewpies endorsed products, too, amongst which was Hendler's Ice Cream of Baltimore, MD. Rose O'Neill was a shrewd businesswoman as well as a writer. For the Kewpie cognoscenti, the Kewpiesta, an international convention of all things Kewpie, is a part of Branson, Missouri's annual Ozark Mountain Spring celebration; the Ozarks were Rose O'Neill's retreat. Despite competition from The Three Redneck Tenors the Kewpiesta thrives. 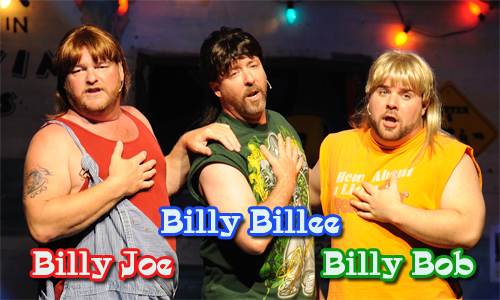 The Three Redneck Tenors, or latter-day Kewpies meet the obesity epidemic. The handkerchiefs included with the book are quite scarce; to have survived as new is a miracle. You know that children immediately used them for whatever purpose necessary until they were ultimately drafted into service as rags, if not soon delicately picked-up with thumb and index fingers, pinky extended, by Mom, who arms-length dropped them into the garbage can as if hazardous waste to become Kewpie hankies in landfill. One hundred years after its introduction the Kewpie brand lives on. If no longer a presence in mainstream American popular culture, it remains so elsewhere in the world. As such, it enters a highly unusual corner of literary history. The Kewpies, Their Book appears to be the first book to become a sandwich spread. 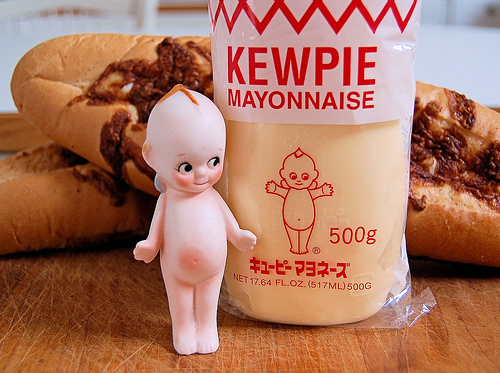 It's Japan's favorite mayonnaise, The Kewpies, Their Mayo. It's a condiment so cute you'll gag. Napkin-handkerchiefs, alas, not included. Why Kewpies in Kyoto? Because Kewpies are Western forerunners of post-WWII Japanese anime and manga, and fit perfectly into Japanese kawaii pop-culture where overpoweringly adorable cuteness is a highly valued aesthetic. O'NEILL, Rose. The Kewpies, Their Book. New York: Frederick A. Stokes Company, (1913). First edition of the first Kewpies book. Quarto. Tan pictorial cloth, stamped in dark brown and with an onlaid color pictorial paper cover label. Accompanied with three Kewpie handkerchiefs, silk-screened with color images of the Kewpies and their friends. Housed in the original pictorial publisher's box. Kewpies book images courtesy of The Literary Lion, currently offering this volume, with our thanks. Image of The Three Redneck Tenors courtesy of TTRT. Image of Japan's Kewpie mayonnaise courtesy of Come From China. Go figure.